They might be naked. But that doesn’t mean they can’t sneak a biro in… And just as you’ve relaxed… BOOM. Bic to the face. Again. Yes. Your toothbrush is a bath toy. Deal with it. At least they’re not using it to clean the toilet rim. Again. Water in the bath is a soapy, warm, splashy bowl of love… water from the shower-head is RAIN OF DEATH AND WILL NOT BE TOLERATED IN ANY CIRCUMSTANCES. Don’t get too close to them with your face… it’s a trap. A soapy Octopal-to-the-eye related trap. Yes, they can turn on the taps. And no, it’s never the shitting cold one. Distract them with the toothbrush and if necessary pull out the ‘big guns’ – i.e. the cotton buds box and a tampon. UNDER NO CIRCUMSTANCES, think you can have a quick wee. 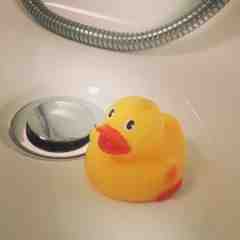 They WILL eat a cotton bud and scold Philip the Duck under the hot tap. You were wrong. Wet hugs ARE the best. Your bath-to-change-table window is 33 seconds. Push this and you are in serious ‘shart’ territory. An Easter Poem. For Crap Mummies. Ha, Mojo noms lavender bubble bath and sponges – quite the refined taste. Hilarious post, captures bath time soooooo well! And it is for these exact reasons why my husband is in charge of bathing the toddler. I call it 'bonding time', he calls it 'hell'. Seriously why do they insist on drinking soapy bath water out of a boat??? I have to wash harry and the dinosaurs (yes the whole bucketful) before i can get near my son with the soap! !